A somewhat special relationship exists between the two Baltimores on opposite sides of the Atlantic — Baltimore, West Cork and Baltimore, Maryland. 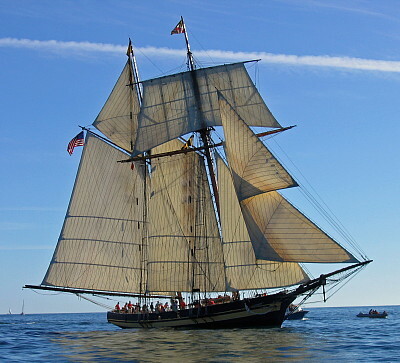 In May 1985 an official proclamation was issued by the mayor of Baltimore MD, William Donal Schaeffer, sending greetings through an unusual ambassador — the sailing schooner Pride of Baltimore. The 129-foot Pride arrived in the harbour of Baltimore, West Cork, at the end of her transatlantic crossing early in May 1985. The crew of twelve completed the 3,500 mile journey in record time, allowing them to enjoy a warm welcome in the village. Many of the crew had Irish ancestry and few will forget the week-long celebrations on her arrival. The Pride was the first Baltimore clipper to sail in over 100 years and was hand-built in 1976/77, using traditional tools and methods. Every feature was an authentic reproduction, including the granite used for ballast in her hull. Her two sloping masts soared 95 feet above the waterline and she carried over 9,500 square feet of canvas. She had a lightweight hull, low freeboard, raking stern and sternposts, all of which made her extremely fast. Traditionally used for what amounted to little more than licensed piracy in the 18th and 19th centuries, clippers needed to be fast. However, the Pride was, unfortunately, not fast enough to outrun a 90 mph squall which hit her north of the Bahamas in the spring of 1986. She sank with the loss of four lives. It was a tragedy all Baltimoreans felt deeply. Community response was immediate and contributions flowed in for the construction of a replacement for the city's clipper. Pride of Baltimore II was launched on April 30th 1988. The new vessel, which is larger and heavier than the original, has been a frequent visitor to her second home.